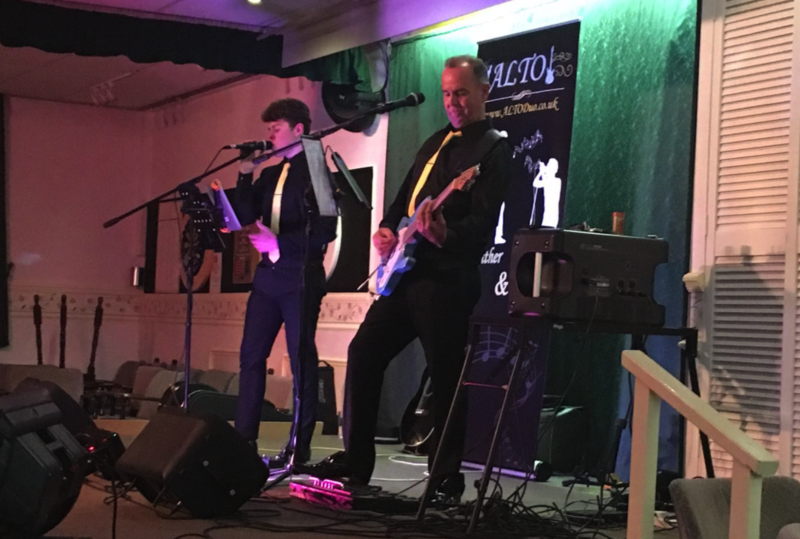 Alto are one of the most popular bands in Dorset and the surrounding Counties. Playing over fifty gigs every year. Their music, spanning nearly 6 decades, cater for a very wide range of age groups making them ideal for functions, weddings, clubs, corporate events, pubs, beer festivals etc. taking audience requests as we go. your event is remembered for all the right reasons! As two very experienced singer/guitarists formed ALTO with the idea of creating something unique. The sound of a live four piece band for the price of a duo. The sound through the high quality P.A system is big, full, and packed with energy that keeps people on the dance floor. Occasionally we are booked alongside a 5/6 piece band or disco for larger functions. Whilst we don’t mind this at all, you will find, as have others, that ALTO is actually all you need to make even the largest function a great success. Need a disco for the end of the night? No problem, with todays technology and our high powered sound system, we provide the best sounding disco music you will ever have heard with all the latest and classic disco tracks plus many other music genres to take the night owls into the early hours of the morning. We have recorded a few tracks for you to have a singalong with.